Recording from live event with Victoria Vives Khuong! 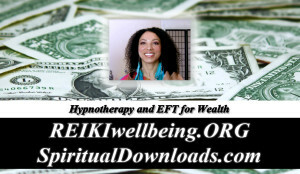 Enjoy Hypnotherapy and EFT for Wealth and Abundance! Most people report that Hypnotherapy has taken them to the most peaceful state they have ever experience. Now it is your opportunity to experience it! Would you like to live free from limitations regarding Wealth and Financial Abundance? You are a walking representation of your subconscious mind. Your subconscious mind stores all the experiences from your past, limiting your present based on past experiences and fears. With Hypnotherapy and Emotional Freedom Techniques, you will easily access and transform any old negative conditioning stored in your subconscious mind and connect with your own Higher Wisdom for direct guidance, discovering true abundance and wealth! For optimal results, practice daily for 21 days. The two Audio Downloads and EFT Chart are available immediately in your Inbox!